In 1964, with the Cuban Missile Crisis fresh in viewers' minds, the Cold War at its frostiest and the hydrogen bomb relatively new and frightening, Stanley Kubrick dared to make a film about what could happen if the wrong person pushed the wrong button - and played the situation for laughs. Dr. Strangelove's jet-black satire (from a script by Kubrick, Peter George and Terry Southern) and a host of superb comic performances (including three from Peter Sellers) have kept the film fresh and entertaining, even as its issues have become (slightly) less timely. Loaded with thermonuclear weapons, a U.S. bomber piloted by Maj. T.J. "King" Kong (Slim Pickens) is on a routine flight pattern near the Soviet Union when they receive orders to commence Wing Attack Plan R, best summarized by Maj. Kong as "Nuclear combat! Toe to toe with the Russkies!" On the ground at Burpleson Air Force Base, Group Capt. 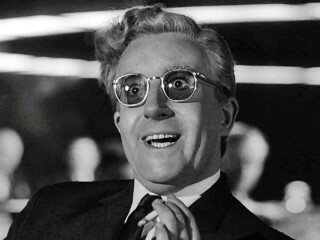 Lionel Mandrake (Peter Sellers) notices nothing on the news about America being at war. Gen. Jack D. Ripper (Sterling Hayden) calmly informs him that he gave the command to attack the Soviet Union because it was high time someone did something about fluoridation, which is sapping Americans' bodily fluids (and apparently has something to do with Ripper's sexual dysfunction). Meanwhile, President Merkin Muffley (Sellers again) meets with his top Pentagon advisors, including super-hawk Gen. Buck Turgidson (George C. Scott), who sees this as an opportunity to do something about Communism in general and Russians in particular. However, the ante is upped considerably when Soviet ambassador de Sadesky (Peter Bull) informs Muffley and his staff of the latest innovation in Soviet weapons technology: a "Doomsday Machine" that will destroy the entire world if the Russians are attacked.